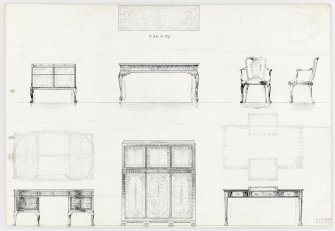 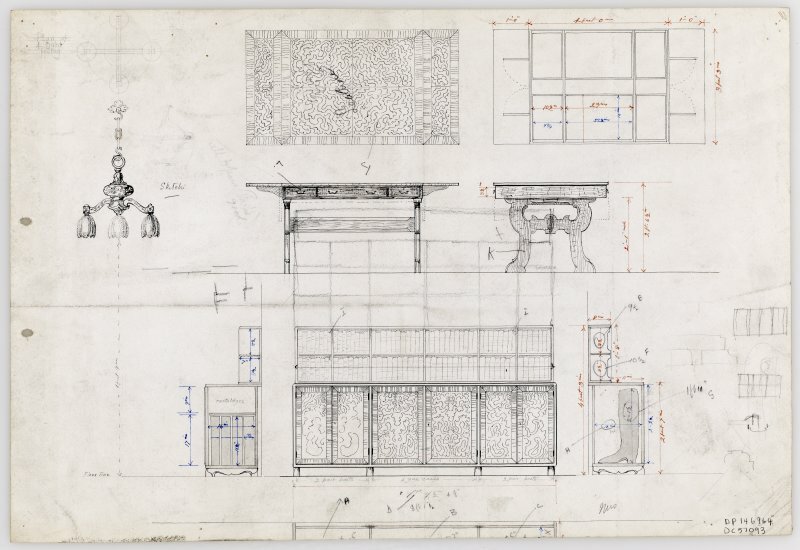 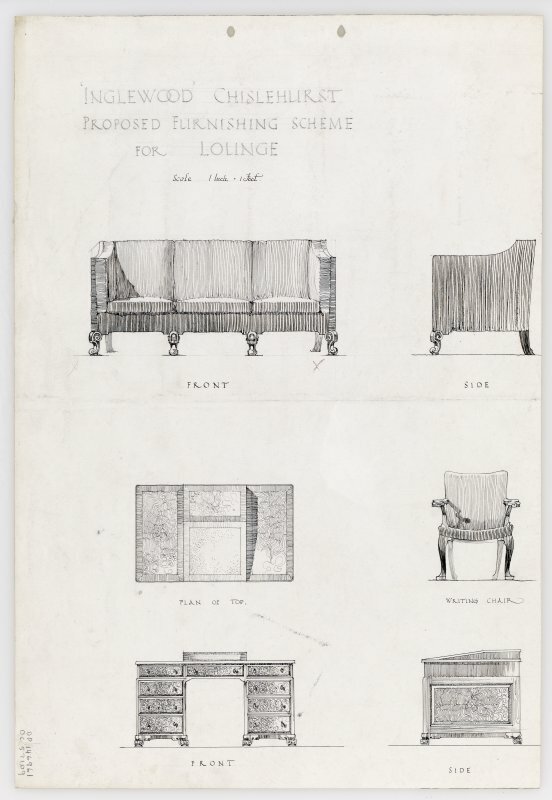 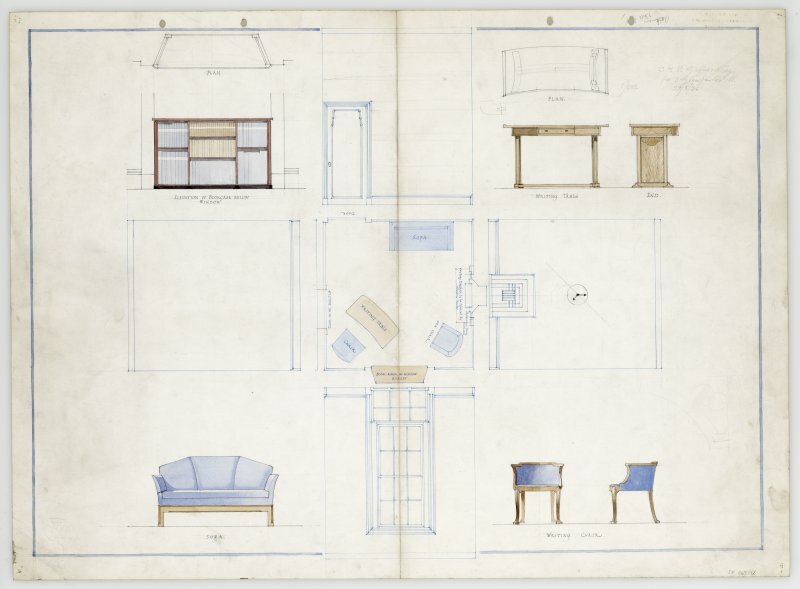 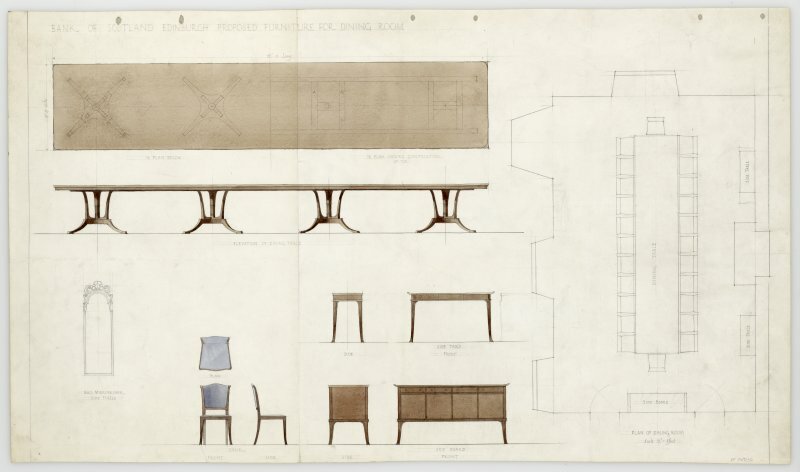 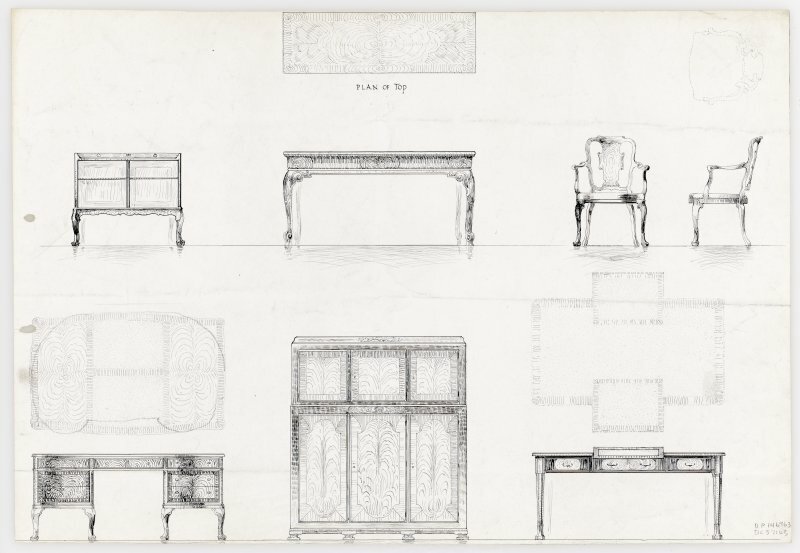 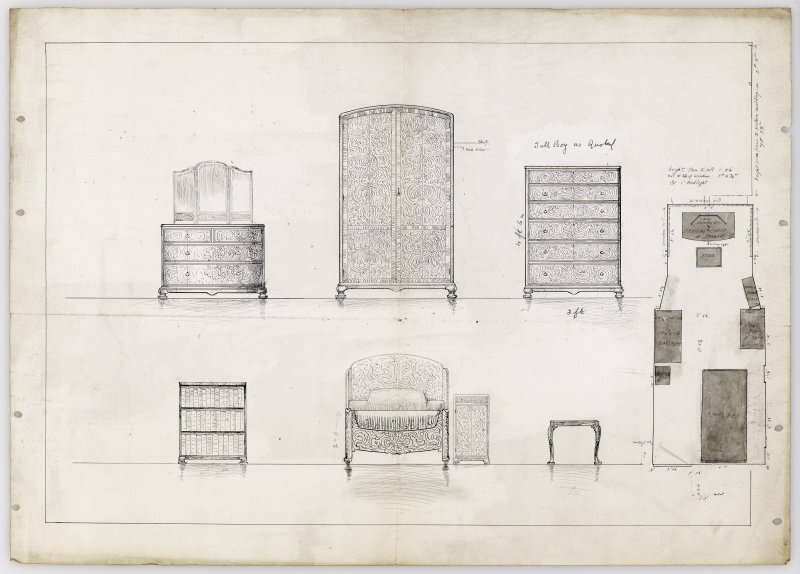 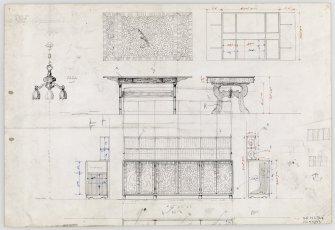 Whytock and Reid would take commissions of varying scales from clients, from the creation of a single item of furniture to the design of an entire home including the furniture, textiles and china. 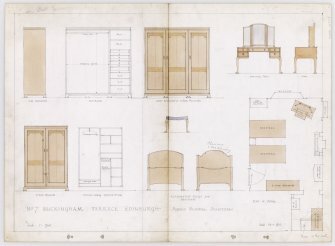 Their clients included family homes, country houses, businesses such as The Royal Bank of Scotland and even the Royal Family. One of their most notable appointments was to refurnish the Royal Yacht Britannia when it came to Leith. 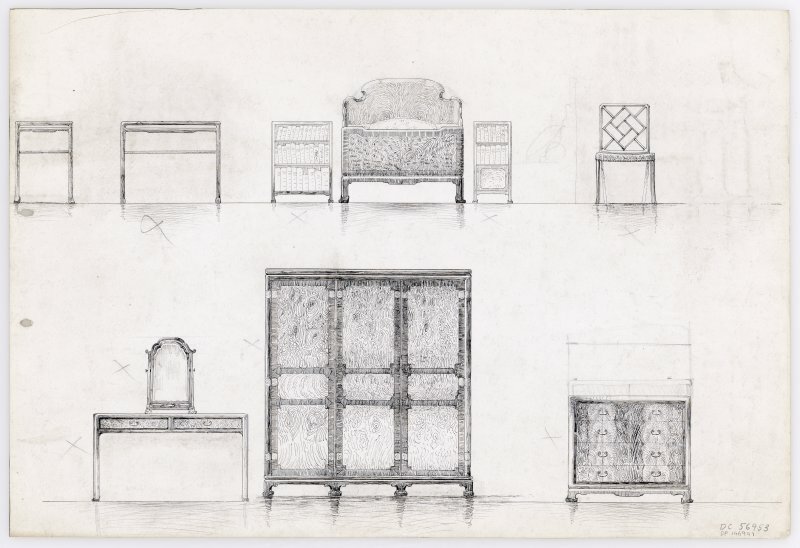 All proposed designs were bespoke in their construction and painstakingly sketched to include every facet of design and detail. 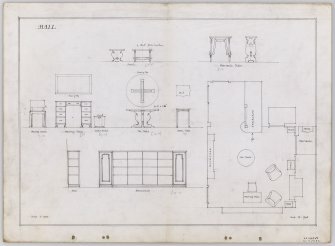 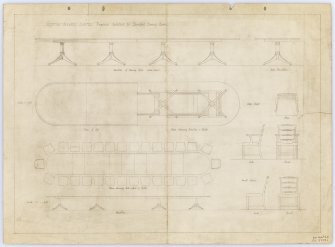 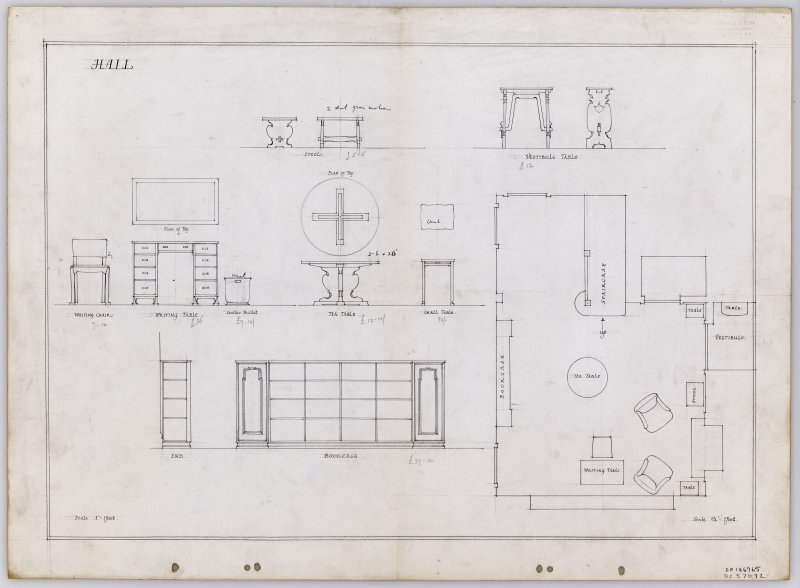 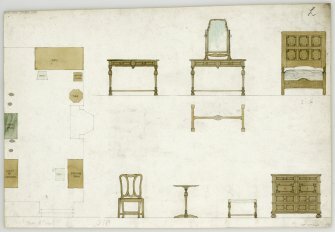 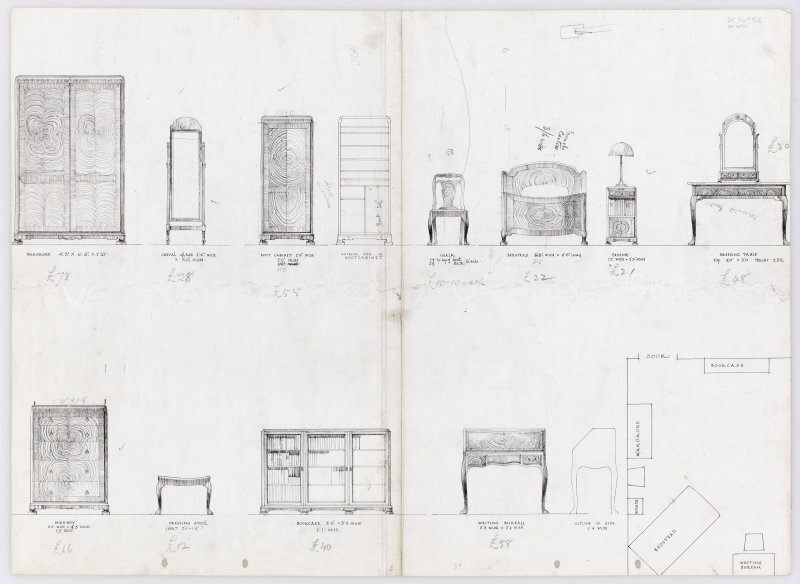 Many of the drawings have attached 'room plans' where the designer has advised where each item of furniture should be placed within the room. Each designer had a different style of presentation, some using watercolour, wash, ink or pencil to illustrate their ideas. 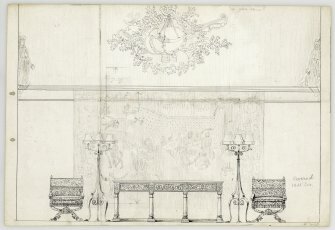 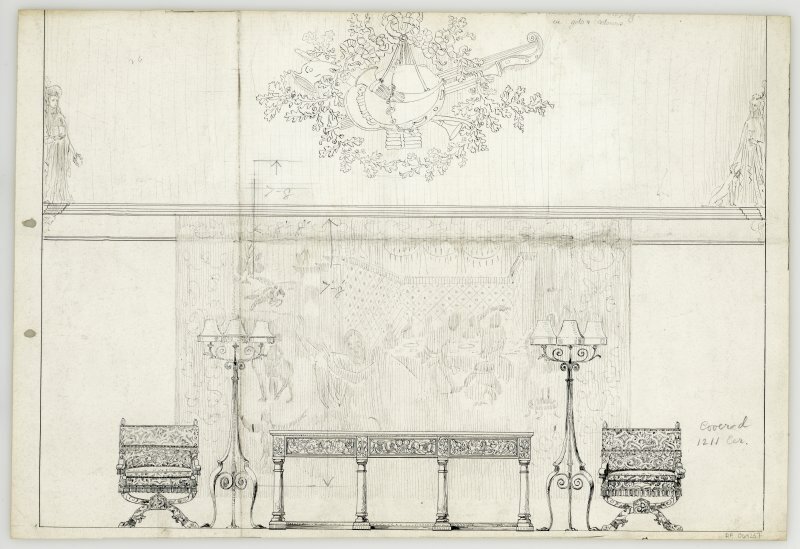 Drawing of design for highly decorative furniture scheme and tapestry. Designs for wardrobe, chair and cabinet. 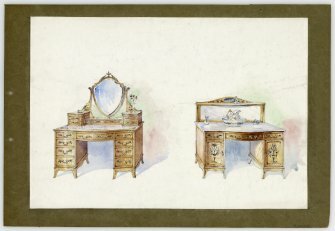 Designs for dressing table and washstand. 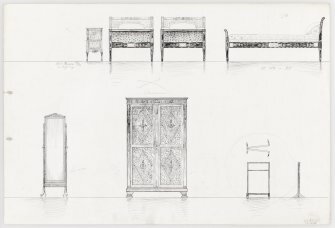 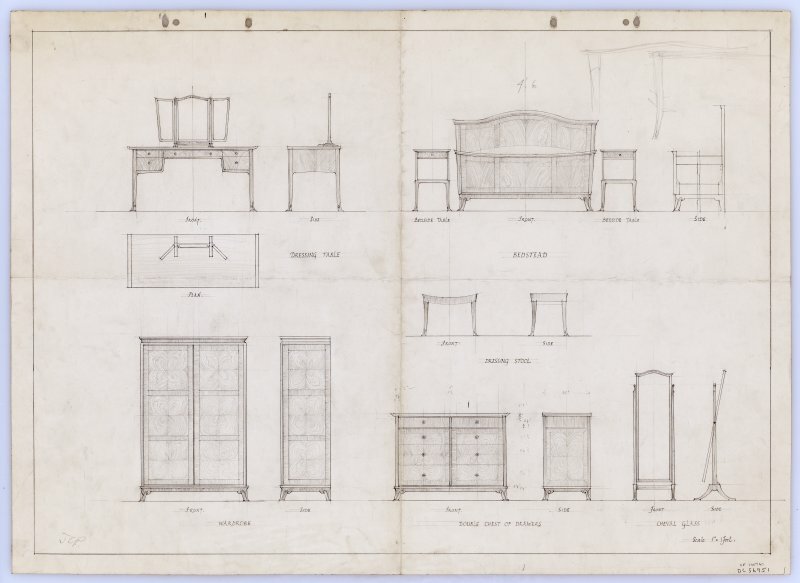 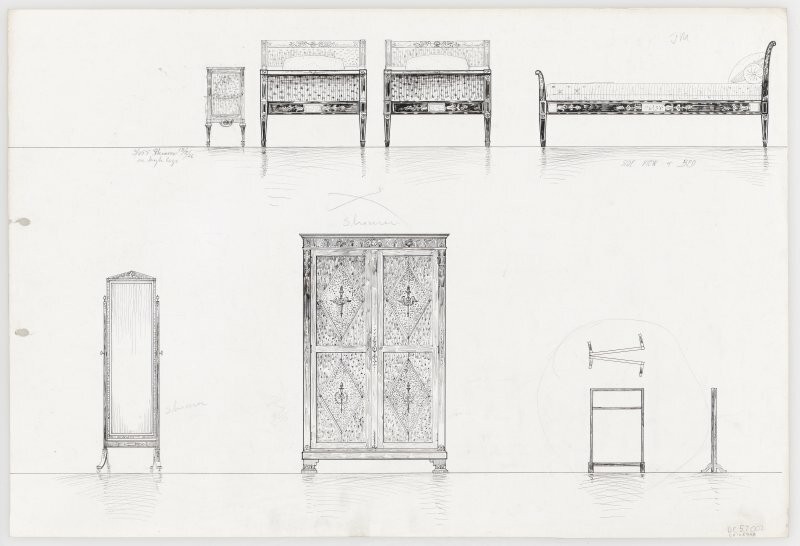 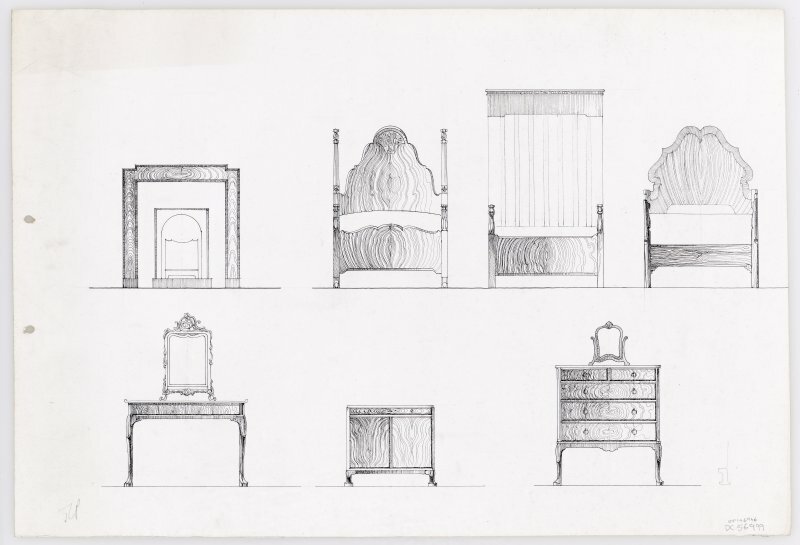 Drawing of designs for bedroom furniture. 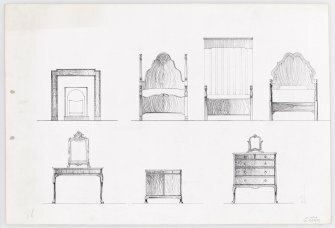 Labeled drawing of designs for bedroom furniture. 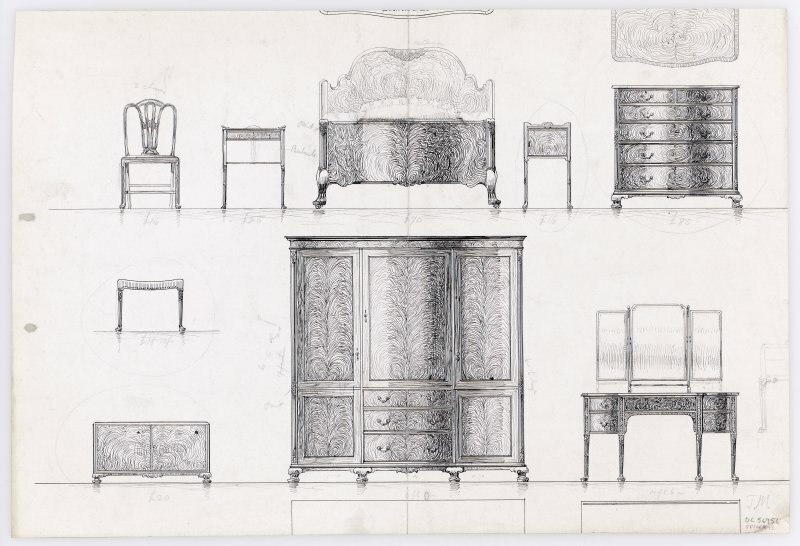 Designs for highly decorative woodern bedroom furniture. 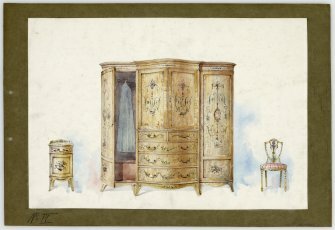 Designs for bedroom furniture including sections of wardrobe interior. Designs of highly decorative wooden bedroom furniture. 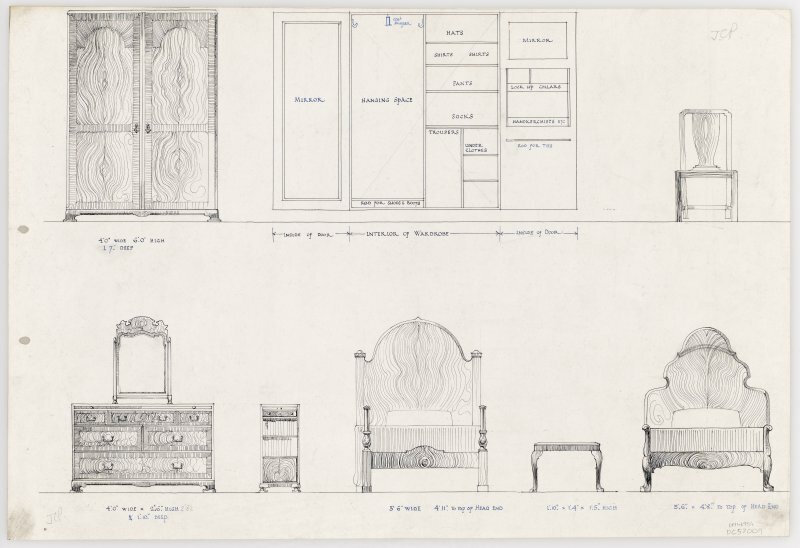 Designs for bedroom furniture with cost annotations. 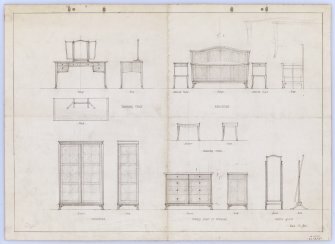 Drawing of designs for bedroom furniture with room plan and elevation. 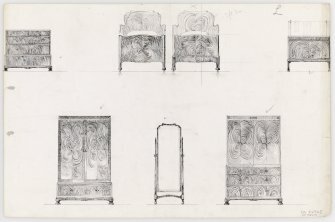 Drawing of three different designs of bedsteads with other bedroom furniture. Drawing of designs for bedroom furniture including a towel rail and cheval mirror. 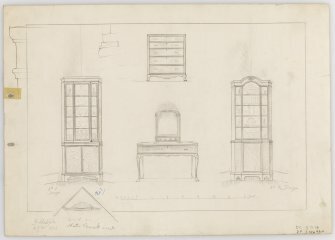 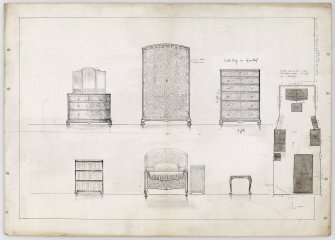 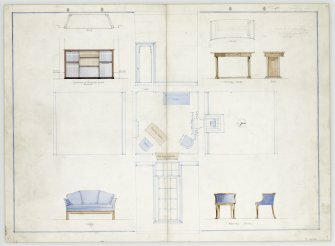 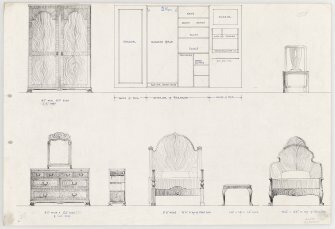 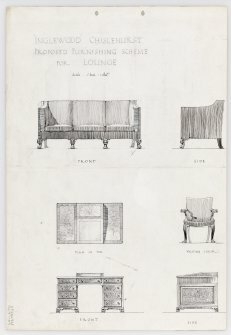 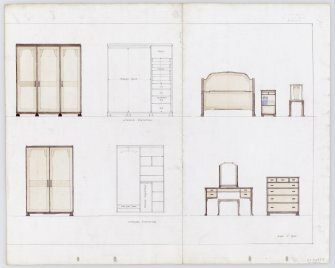 Drawing of furniture design for a bachelors' bedroom. 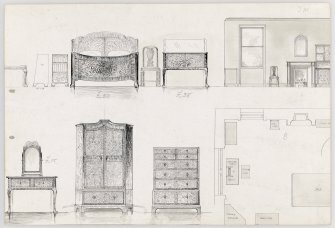 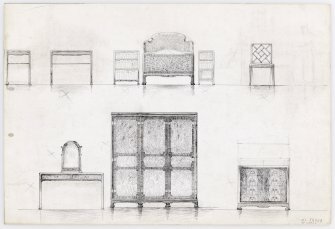 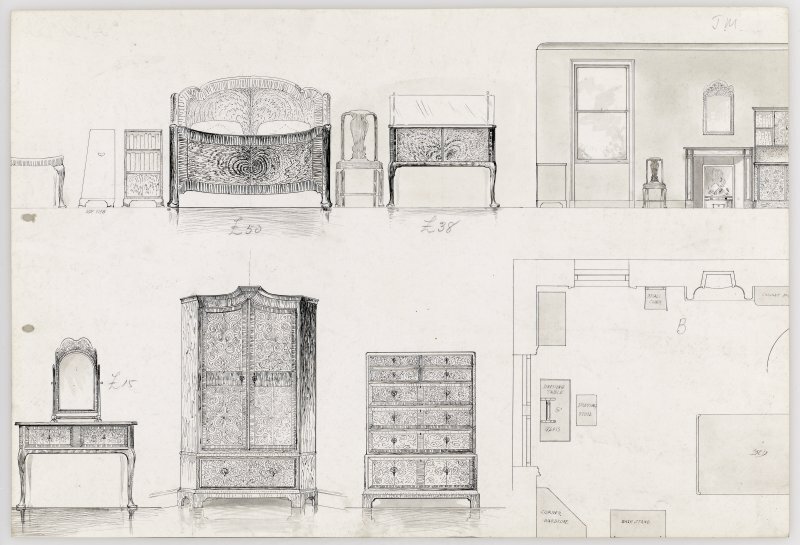 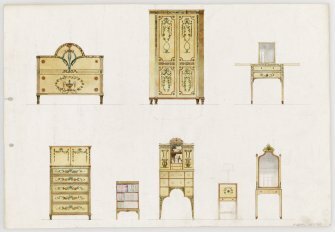 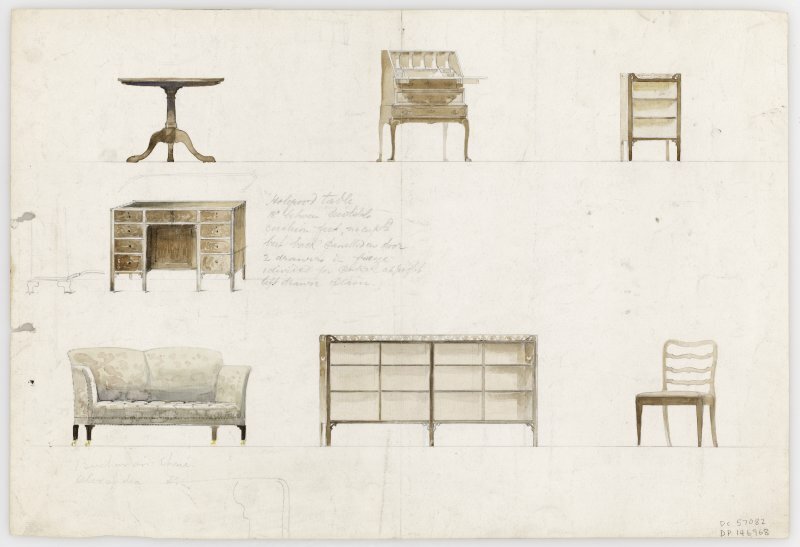 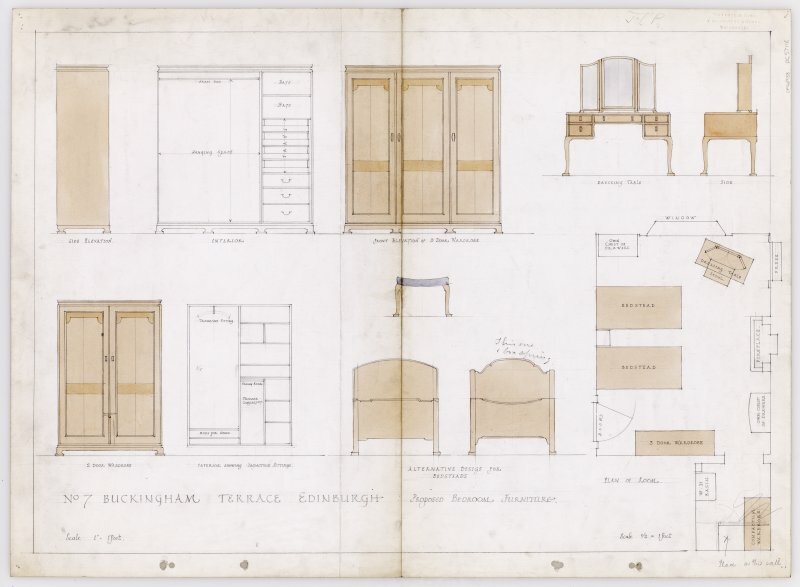 Proposed designs of bedroom furniture for No7 Buckingham Terrace, Edinburgh. 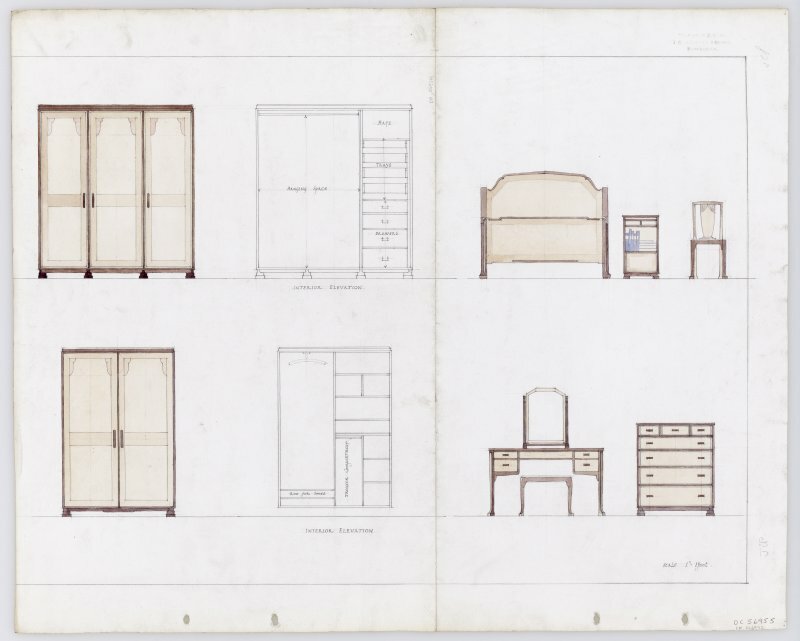 Includes: dressing table, alternative designs for beds and wardrobes. 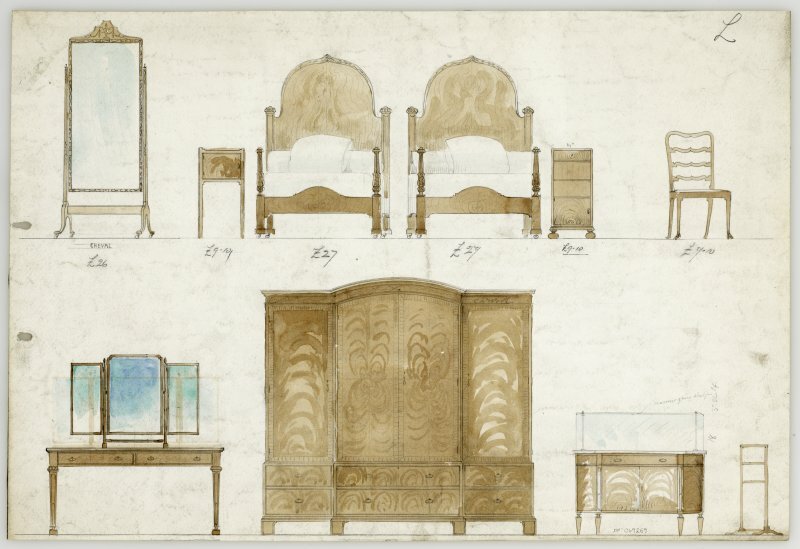 Watercolour of designs for bedroom furniture suite. 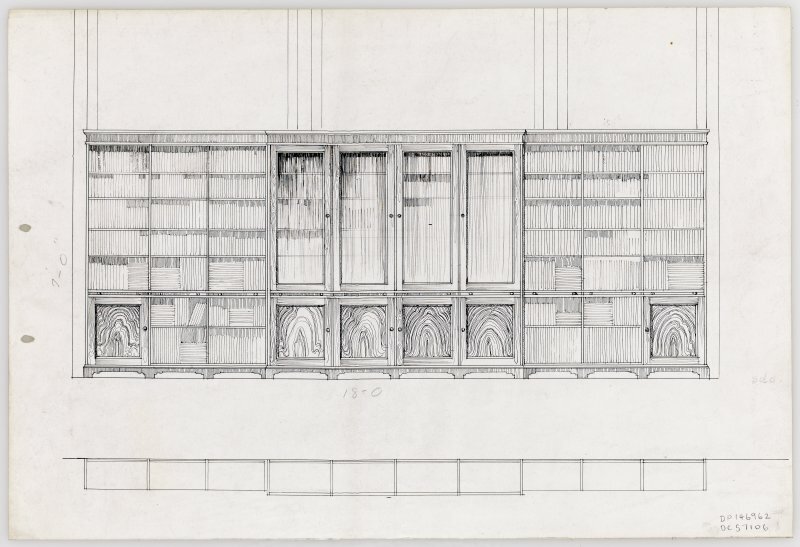 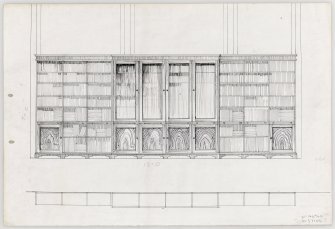 Design for a large scale ten bay bookcase. 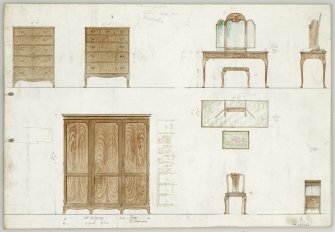 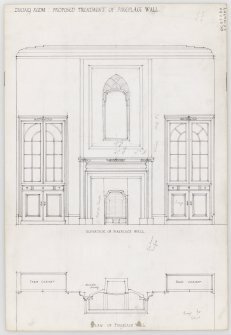 Designs of furniture for 'Hall' with prices and plan of furniture in situ. 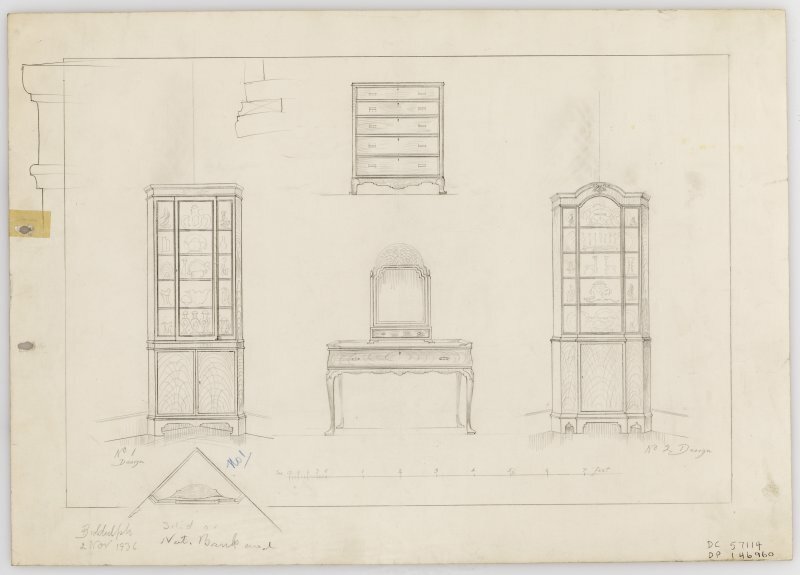 Includes, bookcase, writing table and chair, leather bucket, tea table, stool, vestibule table and side table. 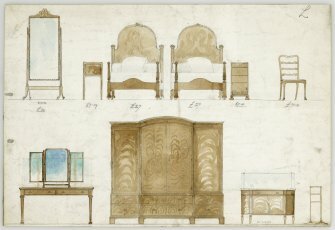 Watercolour designs of lounge furniture. Including buchanan chair, holyrood table, double bookcase, chair, davenport desk and round table. 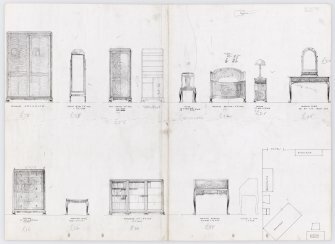 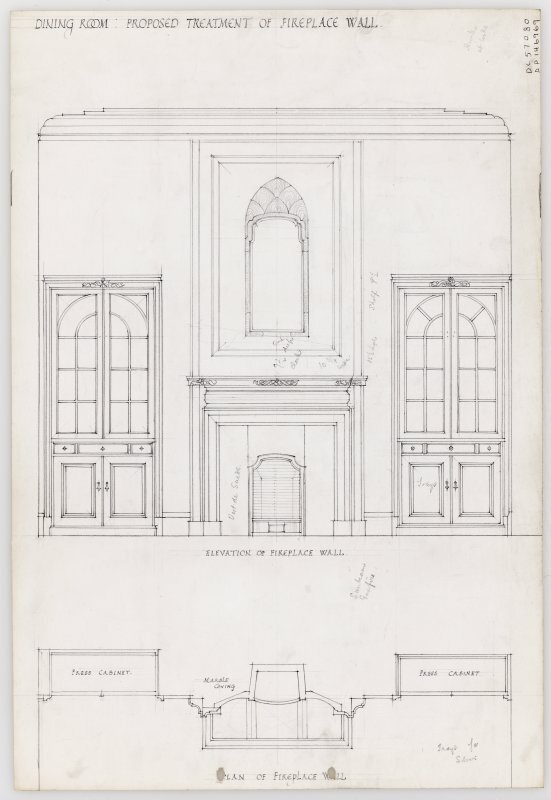 Proposed design of fireplace wall and twin press cabinets, with annotations concerning materials and colours.